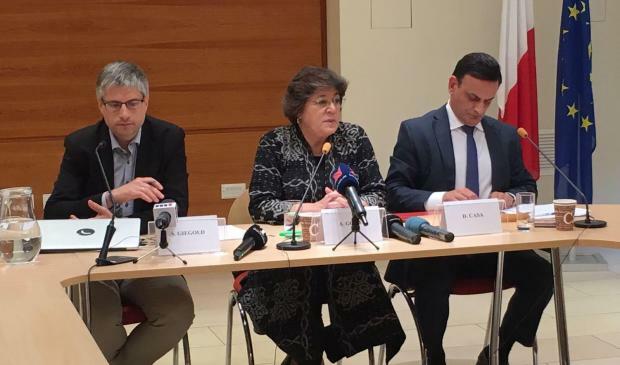 MEPs looking into rule of law concerns about Malta ended a one-day visit to the country with concerns "even stronger" than when they had first visited last year, Ana Gomes said on Friday. "More time has passed," said S&D MEP Ms Gomes. "We would have expected that members of the government who have been exposed as corrupt, as liars, including to us, would not be in office anymore." Ms Gomes was referring to minister Konrad Mizzi and the Prime Minister's chief of staff Keith Schembri, who remain in office despite their secret offshore dealings having been exposed by the Panama Papers. "An election does not clean the record of corruption, anywhere in the world," she said. "Questions of corruption and criminality have to be addressed by police and the judiciary, as well as by the political establishment," she said. "And that's where we see no action or action blocked." She highlighted a number of suspicious deals which had MEPs alarmed, from Malta's hospital privatisation deal to the country's contract with gas supplier Socar, an oil smuggling ring which operated in Malta for years and the country's cash-for-passports programme. Ms Gomes was one of three MEPs in Malta on Friday, in a second round of meetings following an ad hoc delegation’s official visit to the island last November. Ms Gomes also expressed scepticism about the Maltese government's sudden interest in attracting the cryptocurrency sector, linking the industry with "money laundering and organised crime" while adding that its underlying technology, blockchain, remained useful. During their visit, Mr Giegold, Socialist & Democrat MEP Ana Gomes and Nationalist Party MEP David Casa met with representatives of Maltese political parties, magistrates looking into Egrant allegations and Daphne Caruana Galizia’s murder and former EU Commissioner John Dalli, who quit José Manuel Barroso's commission in 2012 after a fraud investigation linked him to attempts to sway EU tobacco legislation. Mr Giegold said concerns about Malta had up the ears of the Council of Europe’s anti-money laundering monitoring body, Greens MEP Sven Giegold told journalists in Valletta on Friday. Mr Giegold said MEPs looking into rule of law allegations concerning Malta had met with Moneyval earlier this week and that the CoE body was alarmed by some of the issues that had been raised. “Malta risks its economic future because of complacency,” Mr Giegold warned. Ms Gomes told journalists that she remained extremely concerned about the fact that a minister revealed by the Panama Papers to have created an offshore setup remained in office. “An election does not clean up your record of corruption,” she said in reference to Malta’s government. Mr Giegold also emphasised his displeasure with Konrad Mizzi, saying that it was now clear Dr Mizzi’s secret offshore setup was set up for business purposes, rather than the “family planning” reasons he had assured MEPs it was for. In other EU countries, Mr Giegold said, a minister who “lied” to a parliamentary committee would be investigated by parliament. Similarly, he said, Malta’s parliament had failed to investigate revelations emanating from the Daphne Project – a collaborative effort between media houses across the globe, including Times of Malta, to continue Ms Caruana Galizia’s investigations. “This is not normal in European countries,” he said. Mr Giegold noted that although Maltese courts heard far fewer cases concerning money laundering than one would expect, even these relatively few cases took far too long to be resolved. Ms Gomes highlighted other concerns about the investigation into Ms Caruana Galizia’s murder, most notably its pace and rumours that magistrate Anthony Vella, who is leading an inquiry into the assassination, would soon be made a judge. That, Ms Gomes fears, would just add a spoke in the inquiry’s wheels and send it all back to square one. All three MEPs expressed consternation that Pilatus Bank had not yet had its licence revoked by Malta’s banking regulator. The bank is currently being administered by an MFSA-appointed former US banking regulator, after its chairman was arrested in New York on charges of having breached US sanctions against Iran. Police commissioner Lawrence Cutajar had ignored a request for a meeting, the MEPs noted. Mr Casa told journalists that he had received assurances from EU Commission president Jean-Claude Juncker that work on EU-wide legislation to protect journalists from Strategic Lawsuits Against Public Participation (SLAPP) would be followed up. He also said Mr Dalli, who had insisted on meeting with MEPs, had shown a lack of respect towards the late Ms Caruana Galizia by referring to her as “that blogger”.